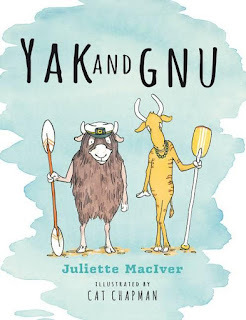 Yak and Gnu are great mates. 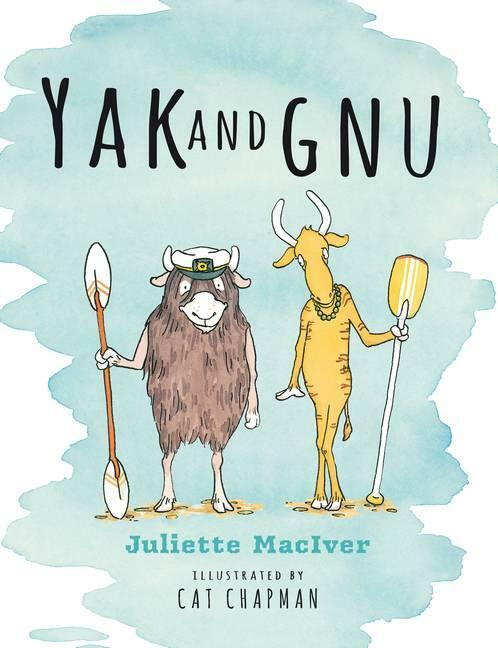 They love to sail down the river together--Yak in his kayak, blackberry-black, and Gnu in his canoe, blueberry-blue. Along the way, they meet a goat in a boat, a calf on a raft, even a snazzy snail, setting sail, not to mention a rat and her clan on a catamaran! Told in rhyme, this story is a tongue-twisting play on words that kids will have great fun navigating (a bit like the friends on their river crafts!). The build up of action and drama is one kids will cling to like a raft on a swelling sea--the book's final pages are jam-packed with chaos they'll simple adore. Cat Chapman's illustrations are action-packed and smile-inducing, with plenty of movement and fantastic colourways. It's so wonderful to see illustrators inject such visual humour into books. Loving this Juliette/Cat pairing--it makes for a rollicking and visually rewarding book.